Southsea Coffee Co is one of those places which you catch sight of from across the street and think “I’m going to enjoy this”. I was actually looking for it, having wanted to visit since it first opened eight weeks ago, but I suspect that had I just been walking down the street, I would have crossed over and gone in. Wife-and-husband team, Tara and Martyn, have put a lot of thought and effort into their new coffee shop and it shows. The layout and decor is wonderful, the atmosphere perfect, the staff warm and friendly and, to cap it all, the coffee’s great! It’s not huge, but feels spacious and uncluttered, helped by the tall ceilings. However, it’s going to get even bigger over the summer when the back yard, which is currently undergoing renovation, is opened to the public. Southsea Coffee Co quite rightly makes a big thing about its local links, with milk from nearby Hayling Island and bread from West Wittering’s Bread a la Mer. As much as possible, it’s about supporting other local, independent businesses. In fact, the least local element is probably the coffee, which comes all the way from Has Bean in Staffordshire! January 2018: I’ve finally made it back to Southsea Coffee Co. These days, Southsea uses London’s Campbell & Syme on espresso with various roasters appearing on the pour-over menu. There’s also excellent breakfast (until 11:30), lunch (11:30 to 15:30) and all-day (until 15:30) menus, but other than the back garden having opened, very little has changed. Most important of all, it still has the same warm, welcoming atmosphere. Southsea is not somewhere that I readily associate with speciality coffee. Indeed, if I didn’t live in Guildford and hadn’t spent the last 16 years catching trains from Waterloo that call at Portsmouth and Southsea station, I might have struggled to tell you where it is, let along know how to get there! And yet, there on Osborne Street, just back from the sea front, stands Southsea Coffee Co, proudly serving fine Has Bean coffee to the unsuspecting locals and the occasional visitor from Guildford. From the outset, it’s a welcoming place. A generous (almost) floor-to-ceiling window takes up the full store-front and the two outside tables look very enticing, especially on the sunny Sunday I was there. Inside, the decor is simple but effective and could easily have been designed with me in mind. Bare wooden floorboards, plain, grey-painted walls, high ceilings and wooden furniture give it a sense of uncluttered space. The atmosphere is enhanced by quiet background music. The counter is in front of you on the right-hand side as you come in, cakes to the fore, while the main seating is provided by tables running the length of the opposite wall. There’s also a low bar at the window with some interesting wooden stools. Finally, at the back, down a couple of steps, there’s a low, rectangular table in an annex with padded benches along two sides. The wall opposite the table showcases local artists, with a new picture every eight weeks or so. The current wall painting (see the gallery) is by Ami Lowman and it replaced one by the owner, Tara. If I have one potential worry, it’s that the wooden benches lining the walls opposite the counter are rather hard on the backside. There are a few cushions, but I’m not sure I’d want to sit there for an hour or two. Southsea Coffee Co offers a basic range of espresso-based drinks, along with two single-origin beans and a decaffeinated one served as pour-overs from a little brew bar beyond the espresso machine. While I was there in 2013, the choice was between a Sumatra Wahana Lingtong and an Ethiopia Kebel Aricha. The latter was described as “floral, sweet and tea-like” at which point I pulled a face and ordered the Sumatran! In a sign of how much my coffee-drinking habits have changed, on my return in 2018, I turned down the Brazilian pour-over (a typical chocolate and nuts coffee according to the tasting notes) for a Rwandan which had rhubarb as one of the flavour notes! Back in 2013, I was rewarded with an excellent cup of coffee. Well, I say cup, but actually it came in a big, cylindrical mug, Over the years, we’ve been conditioned to expect speciality coffee to be served in cups, so it was rather disconcerting when it came in a normal mug. However, it was a very fine mug and contained a full-bodied coffee with a subtle, but not over-powering, sweetness to it. It was served black and while I suspect that if I’d made a fuss, I could have had some milk on the side, it would have been a near-criminal act to spoil coffee this good by adding anything to it. If I have one very tiny complaint it’s that coffee this good needs a glass of water to go with it, so it was a shame that I had to ask for some. However, I was rewarded with a nice, large bottle all to myself (and, I hasten to add, a glass to go with it!). And, in Southsea Coffee’s defence, when I finally returned in 2018, I was presented with a bottle of water without having to ask. Oh, and these days, the pour-over comes in a carafe with a cup on the side. This entry was posted in Breakfast, Cake, Coffee Shops, Laptop Friendly, Lunch, Portsmouth & Southsea, Sandwiches and tagged include by Brian Williams. Bookmark the permalink. 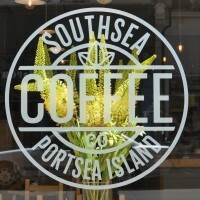 Just happened across your blog via a tweet from Southsea Coffee Co, and enjoyed reading your thoughts about all things coffee. This place in Southsea is great and deserves to be a real success I’ve even tweeted them in the morning and they’ve put by a slice of cake for me to collect on my cycle home – there’s service! They also do a very decent cup of (whisper it) tea. Indeed, whisper it quietly, but it seems that the tea is every bit as good as the coffee! Glad you like the Coffee Spot. Thanks for stopping by. Its good to see our little indie coffee shop has got on the map! !